It's Facebook Fridays! for April 28, 2017, and we want to help you learn about the power of written commands! "Paper in My Shoe" is a practical manual that will teach you the art of petition magic in the African-American tradition of hoodoo and rootwork. The Lucky Mojo Curio Company is holding a random drawing to give away 5 educational spiritual supply prizes that will teach you how to use the power of prepared papers. 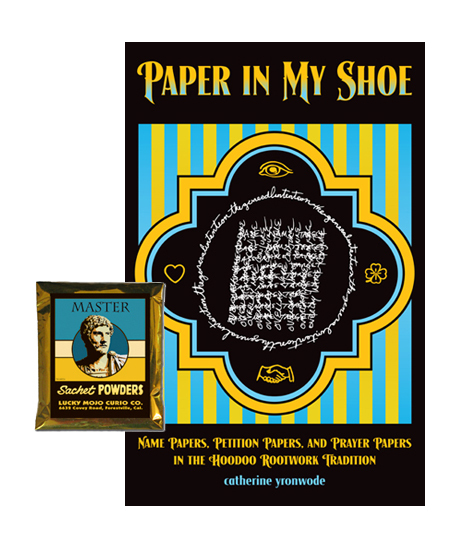 This week each lucky winner will receive a copy of "Paper in My Shoe," catherine yronwode's definitive text on printed magic, along with a foil packet of hand-made Lucky Mojo brand Master Sachet Powders to sprinkle on your printed prayers, dust in your socks, or dress the insoles of your shoes. First thing tomorrow morning, we will select FIVE winners at random, announce their names here, and ask them to message this Facebook Page with their mailing addresses, so we can send them their FREE Petition Mastery products. Thanks for posting this, Ernie -- and, folks, you still have time to get on over to the Facebook page linked above and place your comment. You just might win. We have a winner! In fact, we have 5 lucky winners! Our Facebook Fridays! winners for April 28, 2017 are: Gillian Shelton, Mary Powell, Janelle Burrell, Eugene Fritz, and Cynthia Arnold.